Ship hijackings hit a five-year high in the first nine months of 2010, with Somali pirates responsible for the majority, says a maritime watchdog. From January to September this year 39 hijackings were reported - up from 34 in the same period of 2009 and 11 in 2006, it said. 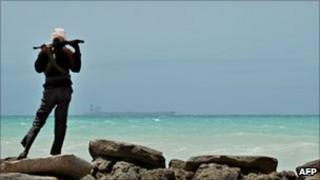 Somali pirates - who were striking as far away as the Red Sea - were responsible for 35 of the hijackings. It also reported a three-fold increase in attacks in the South China Sea. "Somali pirates intensified attacks away from their own coast" in the first nine months of 2010, said the International Maritime Bureau in a news release accompanying the release of its report on Monday. It said a strong foreign naval presence in the Gulf of Aden off the Somali coast had actually led to a drop in the number of piracy incidents there, from 100 in the same period last year to 44 this year. But Somali pirates were moving away from such well-patrolled areas to larger adjacent seas. In June 2010 a chemical tanker was hijacked in the southern Red Sea - the first such hijacking reported in the area, the IMB said. "The actions of the navies in the Gulf of Aden and the Somali basin have to be once again commended," said Capt Pottengal Mukundan, director of the IMB. "Increased intelligence gathering coupled with strategic placement of naval assets has resulted in the targeting of suspected Pirate Action Groups before they become operational. "However, this is a vast area and the navies cannot realistically cover it. The naval presence does however remain vital to the control of piracy in this area." Overall, the number of piracy incidents globally - comprising attacks and boardings - dropped slightly from 306 in the first nine months of 2009 to 289 in the same period this year. But the IMB reported concern about the South China Sea, where there has been a resurgence in piracy incidents once virtually eradicated by naval patrols. Recorded incidents there this year so far have tripled to 30 from 2009. "The pirates in this area use almost identical methods of attack, suggesting that a small number of groups is responsible," said Capt Mukundan. The IMB also warned of a rise in piracy around the Bangladeshi port city of Chittagong, and around Indonesia.